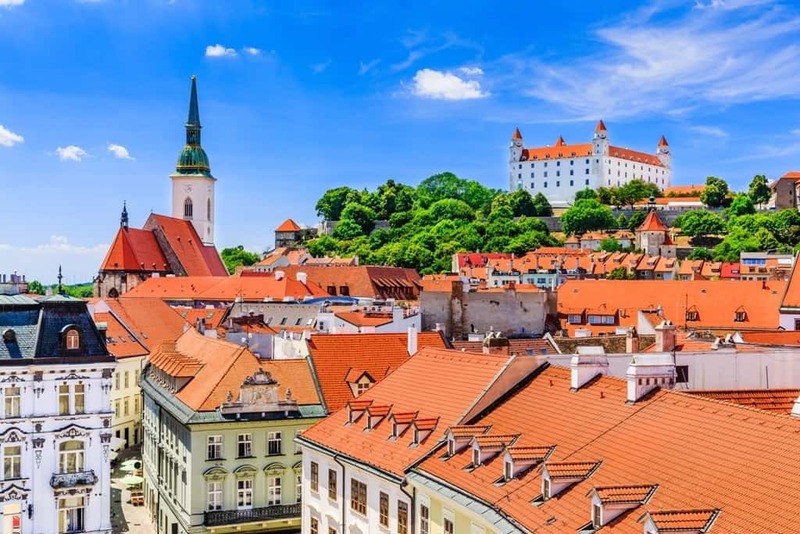 Bratislava, the capital of Slovakia, is not only a stunning historic city, but one filled with beautiful natural wonders that will take anyone’s breath away. 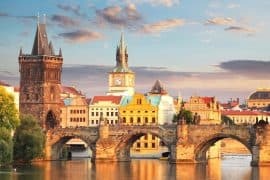 Situated next to the Danube River, it’s located near the borders of Austria and Hungary and features the majestic Little Carpathian Mountains. 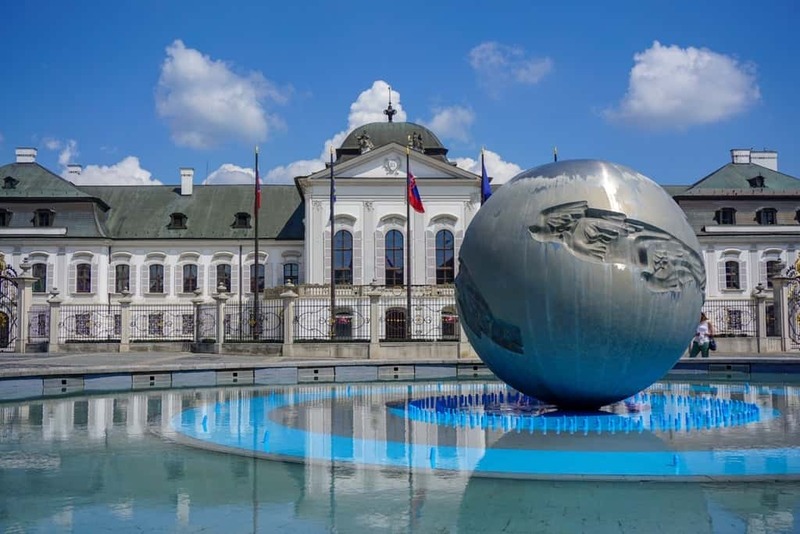 You’ll find plenty of things to do with one day in Bratislava, although limiting your itinerary down can be a little difficult due to the wide selection available. 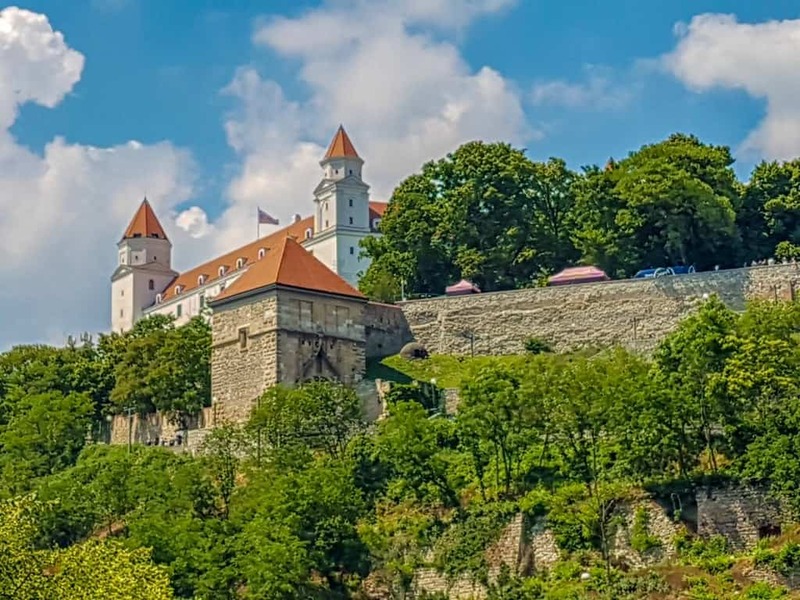 If you’re looking for some of the top things to do in Bratislava in a day, you’ll find some suggestions below as to what you can explore and experience while here. 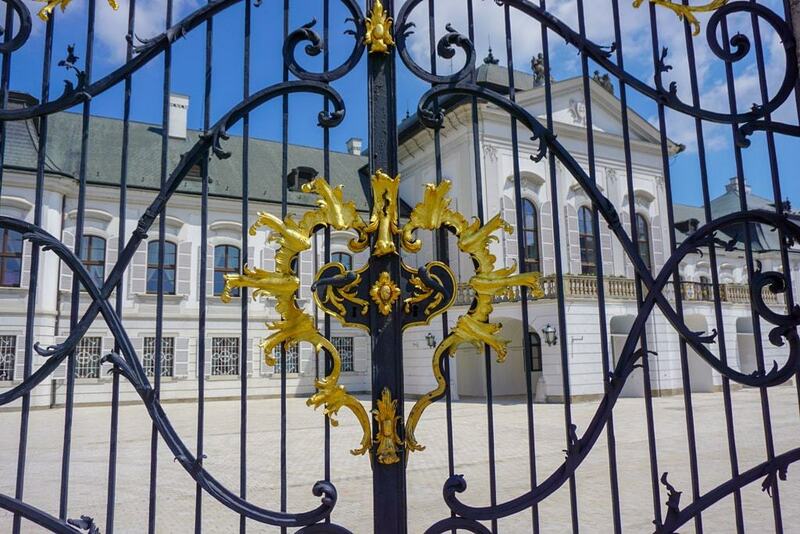 Known locally as the Grassalkovich Palace, this structure serves as the official home of the president of Slovakia. Featuring stunning architecture, this site is rich in history. 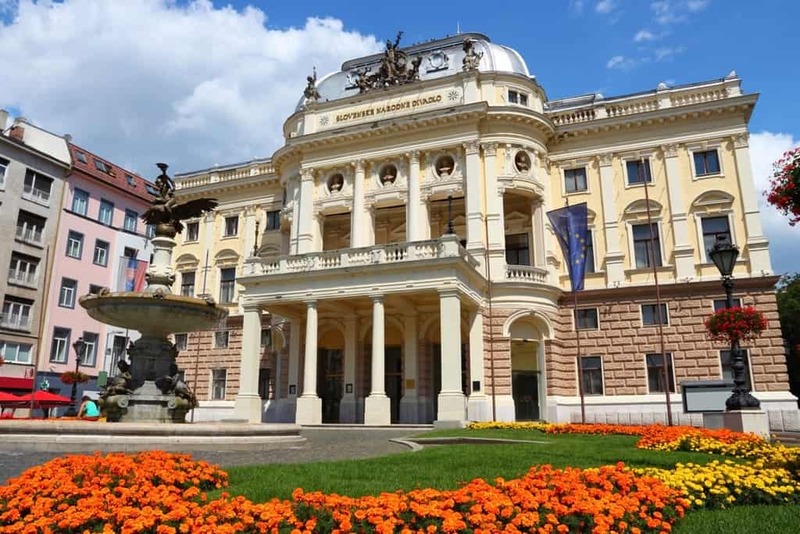 Besides being the center for Slovakian politics, it was once home to many of Joseph Haydn’s concerts. Built in 1760, it was not only designed to be the home to the president, but was considered the best place in the country to hold parties and balls. While the interior of the palace is opened to the public only once a year, you can usually walk around outside to see its exterior. While doing so, you’ll find that the palace features some interesting outdoor sites. There’s an intricately designed gate in the front of it as well as a fountain created to be in the shape of the earth. In the back of the palace, you’ll also find a luscious French garden filled with various types of trees and flowers which now operates as a public park. In addition to the park’s stunning landscapes, there are different pieces of artwork scattered around its grounds. After touring the palace and its park, you can stop over by Michael’s Gate which is located just a few minutes away. Michael’s Gate is one of the only city gates in the country from medieval times that has been saved and preserved. 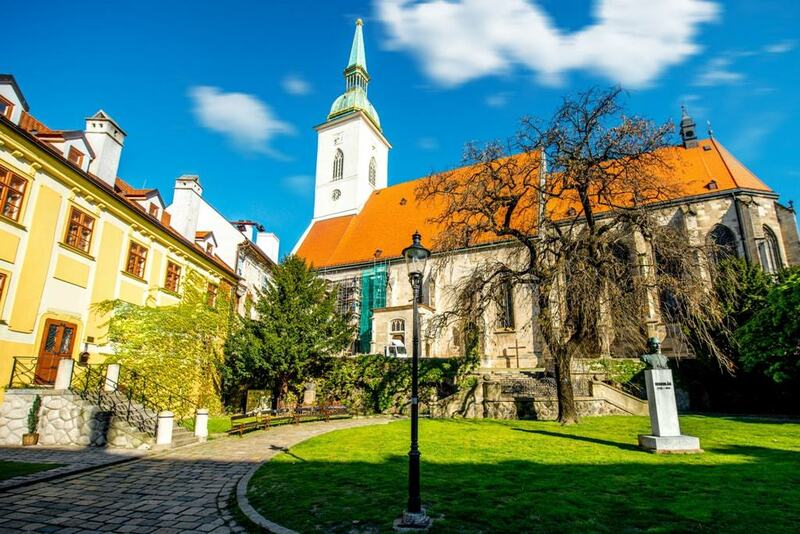 It is considered to be one of the oldest spots in all of Bratislava and serves as the entrance to the city’s Old Town. Built in the 14th century, the gate features a dazzling baroque architecture and an impressive copper roof that glistens under the sunlight. The gate towers over the town and features seven stories inside that you can climb up to get stunning views of the town. You can take a few pictures at the gate and then walk over to some nearby cafes and shops located next to it. 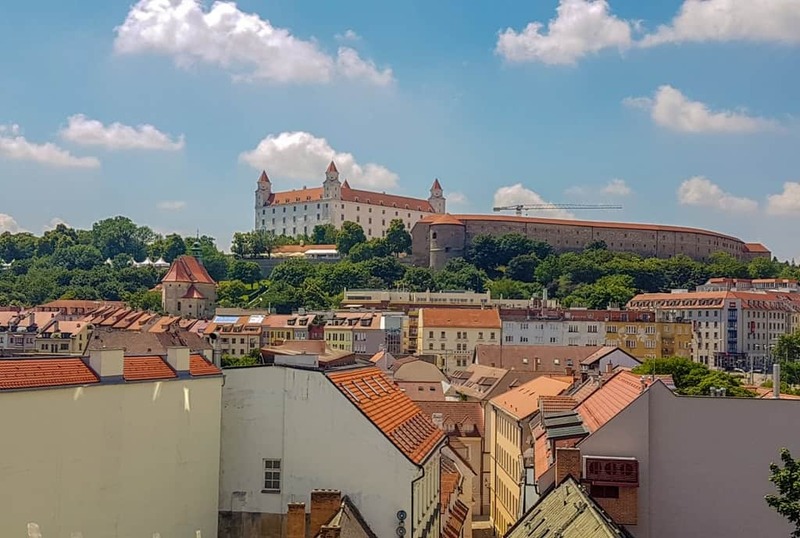 The Museum of Arms at Michael’s Tower is nestled between a few buildings near Bratislava’s Old Town and can easily be seen with its towering white façade. It was built during the 13th century, but later reconstructed in 1758 which added a few different things to the tower, like a statue of the Archangel Michael with a dragon. While here, you can climb up the tower’s many staircases to the top where you’ll be able to get amazing views of the city below. 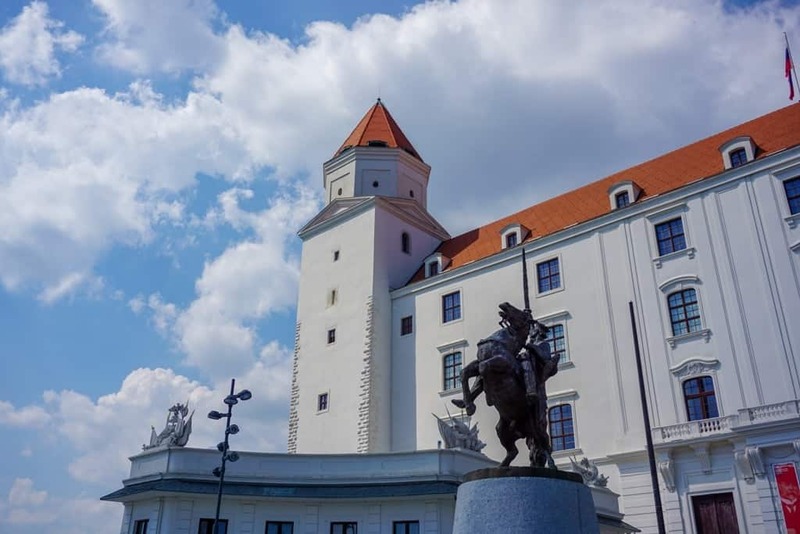 Besides offering a stunning view of Bratislava, the tower is also home to a museum which contains many different items that tell the story of the city’s history. There are three different levels of the museum, which can be found by climbing the different staircases inside. These levels contain various types of ancient artifacts once used to protect the city like weapons and firearms. In addition to this, you’ll also be able to see the various types of tournament arms. To enter the tower and museum, you do need a ticket which can be bought at a stand inside. The Old Town Hall is a historic collection of 14th century buildings lined up next to each other. 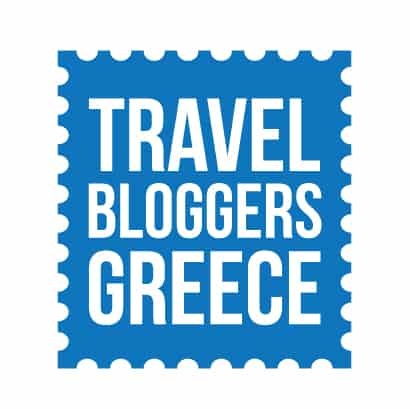 You’ll find some very intriguingplaces here, like the Main Square and Primate’s Palace. 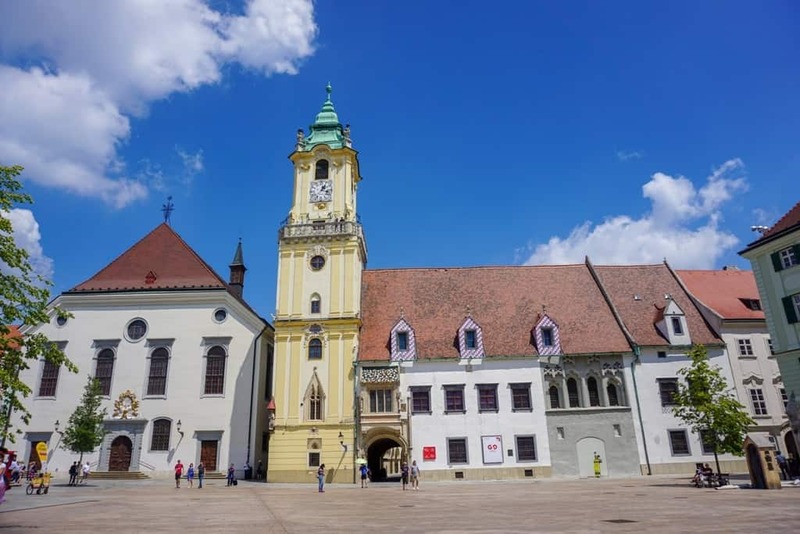 The Old Town Hall is home to a city history museum which includes many exhibits that tell the story of Bratislava. In addition to seeing interesting artifacts here, you’ll also get to see amazing panoramic views over the city at the top of the building. 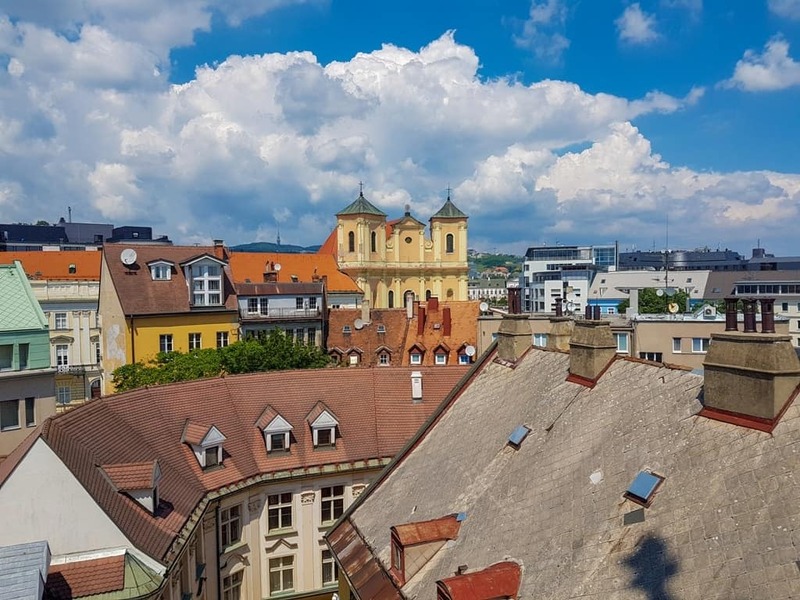 In fact, after walking up to the roof, you can stroll around outside on a walkway built around the edge of the Town Hall’s tower so you can get a better view of the city. 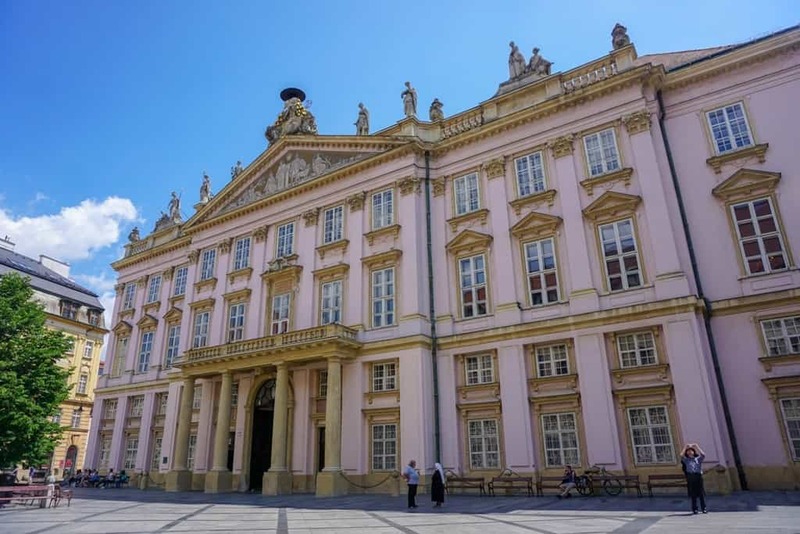 Primate’s Palace was built back in the late 1700s and features a beautiful neoclassical design. Inside the palace, you’ll find plenty of amazing exhibits and rooms. One of the most popular destinations in the palace is the Hall of Mirrors which was where the Peace Treaty of Pressburg was signed back in 1805. Today, the room serves as the spot for the local city council to hold meetings, but guests are allowed in to take photos and explore the room. You’ll find that this room is also connected to five various salons which are each decorated in their own specific color, like green and blue. The palace also features many historic portraits of former rulers and even colorful tapestries which were discovered during a renovation of it. In addition to this, you’ll find statues scattered around the grounds and you can stop by the Chapel of St. Ladislaus which is situated right next to the palace. If you’re looking for an extremely historic spot to check out while in the city, the Main Square is one place you’ll want to visit. 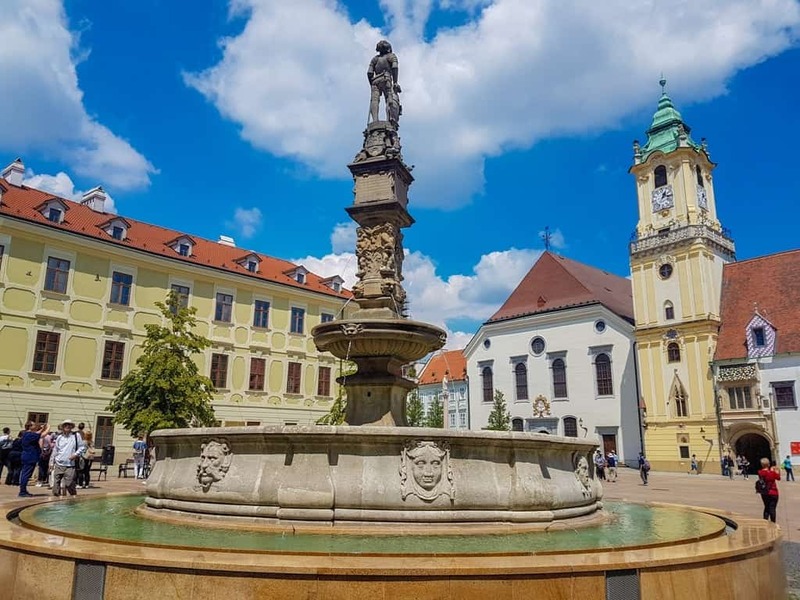 As the center of this city, and as one of the most famous main squares in Slovakia, the BratislavaMain Square is packed with history. Here, you’ll find not only the Old Town, but also Bratislava’s Old Town Hall and its magnificent clock tower. The Maximilian Fountain is also found in this square as well as many other fascinating attractions like statues and shops. 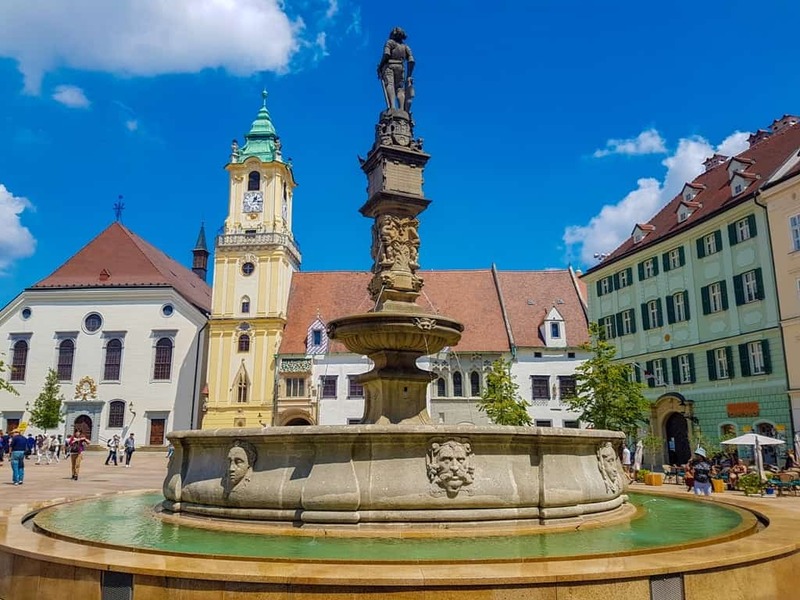 Maximilian’s Fountain is situated in the middle of the Bratislava Main Square and is one of the most popular attractions in the city to venture to. 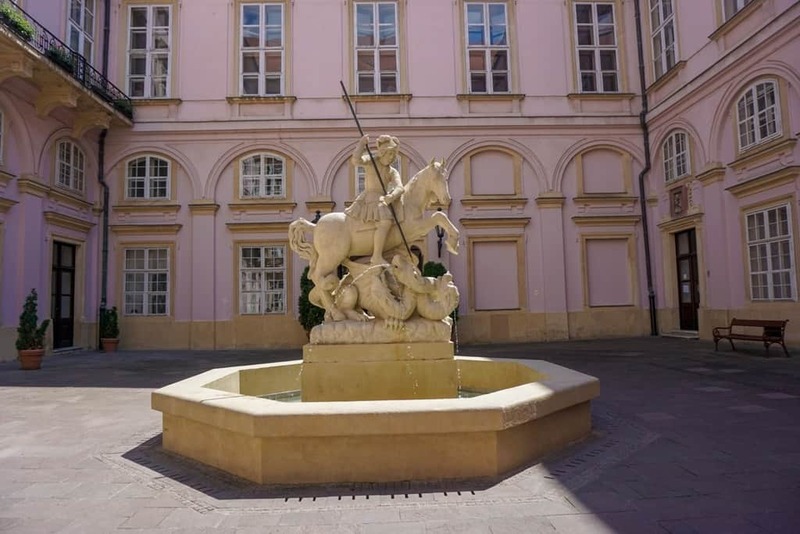 Also known as Roland’s Fountain, it was built in 1572 as a way to honor the former Hungarian king Maximillian II. This towering fountain is not only well-known for its distinctive design, but for its unique legends. One legend, for instance, states that the knight at the top of the fountain slowly turns around and bows at the Old Town Hall at the stroke of midnight on New Year’s Eve to honor those who gave their lives to save the city from destruction. This legend is the most popular, but there is another one that states that the knight draws his sword and waves it around on Good Friday to show that he is still protecting the city. The fountain is located near some cafes, so you can stop by and grab a bite to eat at one while gazing at this magnificent fountain. Another fantastic thing to do while in Bratislava is to walk around the Old Town. This charming little section of the city is a great place to fully experience the historic spirit of Bratislava. 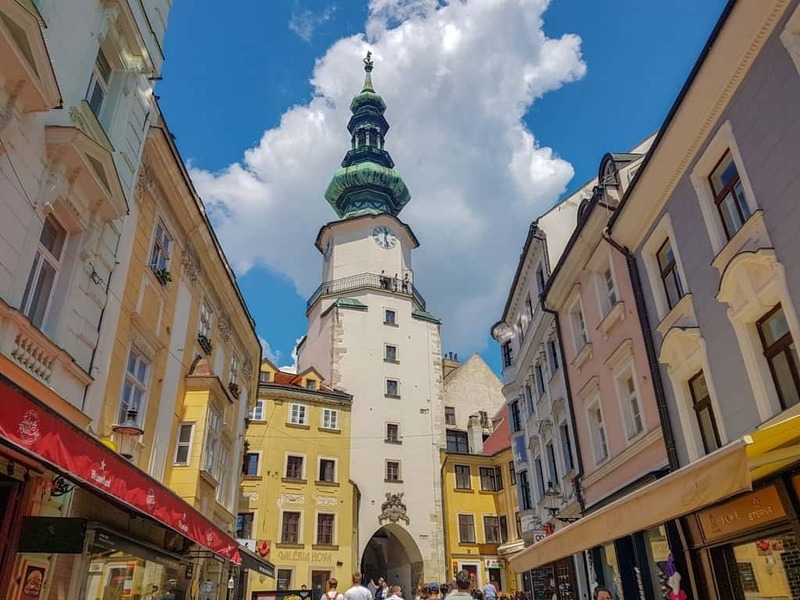 The Old Town was once the main section of the city so you’ll find many notable buildings and structures scattered around it, like St. Michael’s Tower, Zichy’s Palace (once the home of Count Franz Zichy), and the Bratislava Main Square. 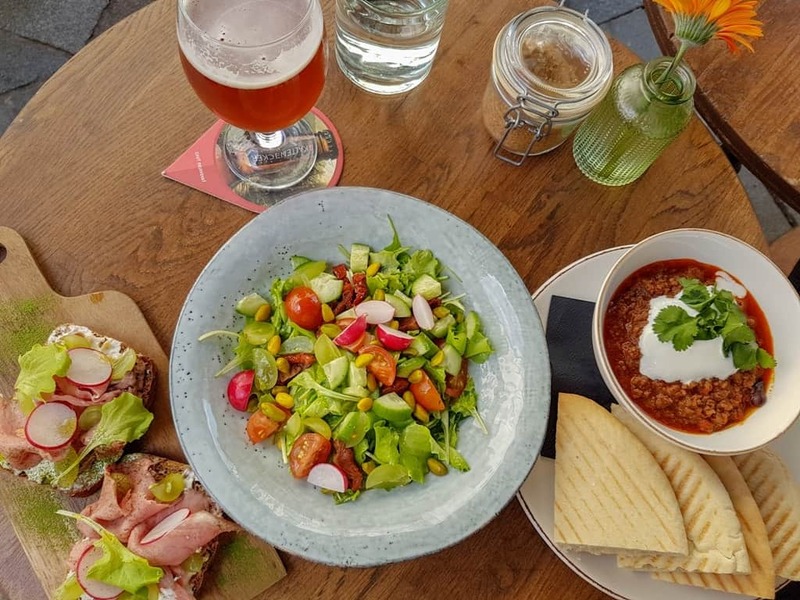 When you’re done exploring these places, you can stop by one of the many cafes in the Old Town and grab a quick bite to eat or a freshly brewed coffee. This stunning structure sits beneath the shadow of the Bratislava Castle. Created with Gothic architecture, St. Martin’s Cathedral has seen many historical events, such as the coronations of various Hungarian kings. The cathedral offers tours inside which will take you around to the different intricately designed chapels so you can experience them yourself. You’ll also be able to see some artwork inside, like one of the first central-European sculptures made entirely of lead depicting St. Martin. The cathedral also offers a few events throughout the year you can partake in, like a depiction of a coronation event. 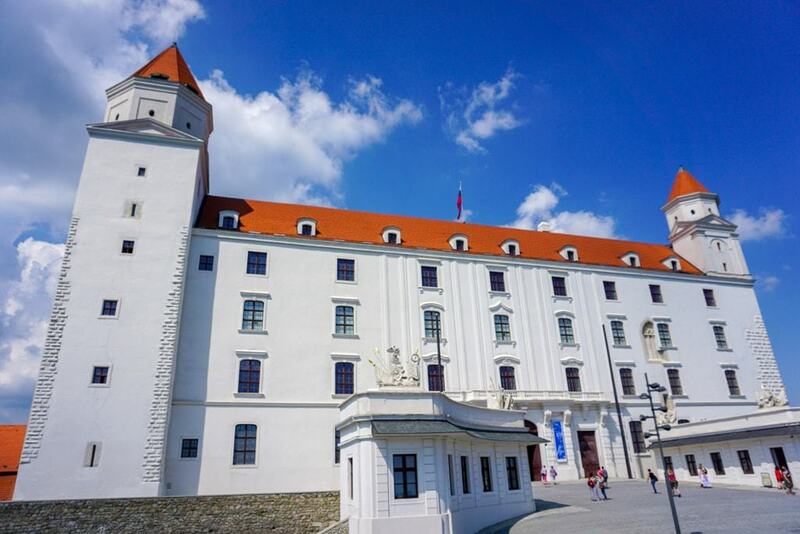 One of the most iconic places in Slovakia’s capital city to visit is Bratislava Castle. This towering structure looks over the city with its dazzling architecture featuring a bright white exterior, red roof, and numerous towers built around it. The castle has a rich history which you can learn about while exploring it. 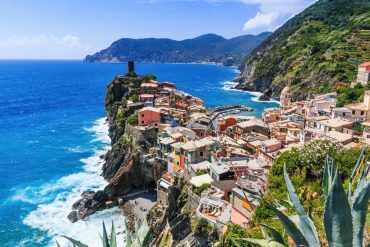 You’ll discover many things, like how it was the centrallocation in various wars and how it was rebuilt many times throughout the years due to destruction or just a change of the current resident’s tastes. 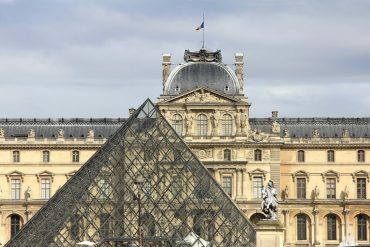 Originally built in the 9th century, you can wander around its intricately designed halls and gaze at the pieces of artwork hanging from its walls, many of which are priceless. You’ll also be able to see its famous tower, known as the Jewel’s Tower, where the coronation crowns for Hungarian royalty were once stored. After a tour of the interior, you can step outside and get a view of the nearby remains of what was once the Great-Moravian Basilica. Starý Most, which translates to “old bridge,” is a recent addition to the city of Bratislava and spans across the Danube River giving guests amazing views of the surrounding river and city. It measures over 1,510 feet long and features a road, walkway, and even a railroad track running across it to help connect Bratislava to anotherpopular Slovakian area–Petržalka. It’s the perfect spot to go for a walk to get views of the river or for a quick bike ride around the area. The Slovak National Gallery was created in 1948 and features numerous art exhibits you can browse through. You’ll find that the gallery offers many different exhibits throughout the year of various art styles so there’s always something new to see. You can even sign up to take a guided tour which will have a host lead you around the museum and tell you interesting information about the pieces hanging in the gallery that you might not know. When you’re done looking around, you can stop by the gallery’s bookstore to find some resources about the paintings you just saw or visit its café for some scrumptious snacks. Also known as the Blue Church, the Church of St. Elisabeth is known citywide for its unique art nouveau design. 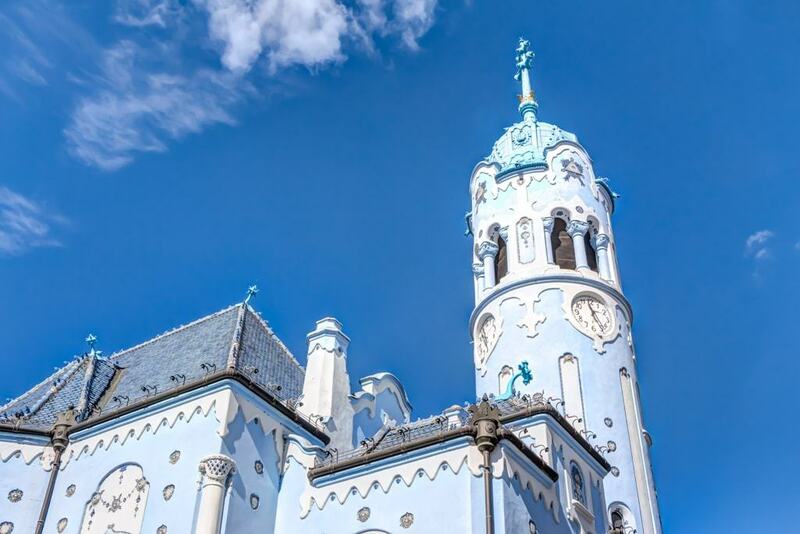 Created by the architect Edmund Lechner, the church features a soft blue exterior with white accents and a deep blue tiled roof. You’ll also find many beautiful towers built around it, including one that stands over 121 feet tall. The church also features some unique plants and landscaping around it which makes this structure truly an architectural marvel. But it isn’t only the exterior that features a vast collection of blue colors, but the interior as well. You’ll find mosaics, artifacts, and many other interesting things inside, all of which are in the color blue. Keep in mind the church is only open during certain times of the year, so if you’d like to check out the inside, you’ll have to keep a close eye on its schedule. The Church of St. Elisabeth is situated near the Old Town, so it’s just a quick walk over from it if you happen to be in the area. As one of the oldest professional theaters in Slovakia, this theater is one place everyone exploring Bratislava needs to check out. Designed in 1886 with a Neo-Renaissance architecture, it offers many fun and unique performances throughout the year. The theater is considered to be one of the most important places in Slovakia due to its strong cultural heritage and displays many different types of classic Slovakian dramas, operas, and ballet performances. The interior of the theater features stunning busts of distinctive composers that are sure to amaze music lovers. While the old theater building is still in use, there is a new addition to it which was designed to help expand the number of performances in the theater. 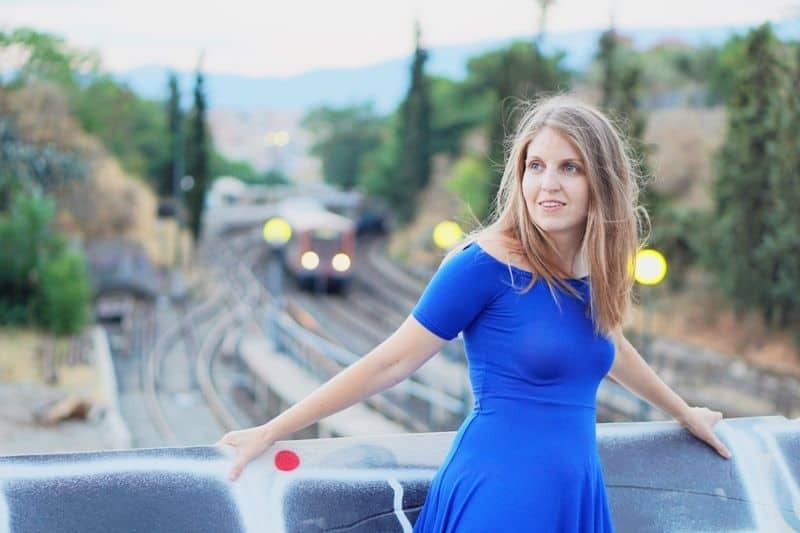 You can buy tickets to see a performance while in the city without needing to make reservations. Bratislava is filled with incredible statues, many of which reside in the town’s Old Town section. 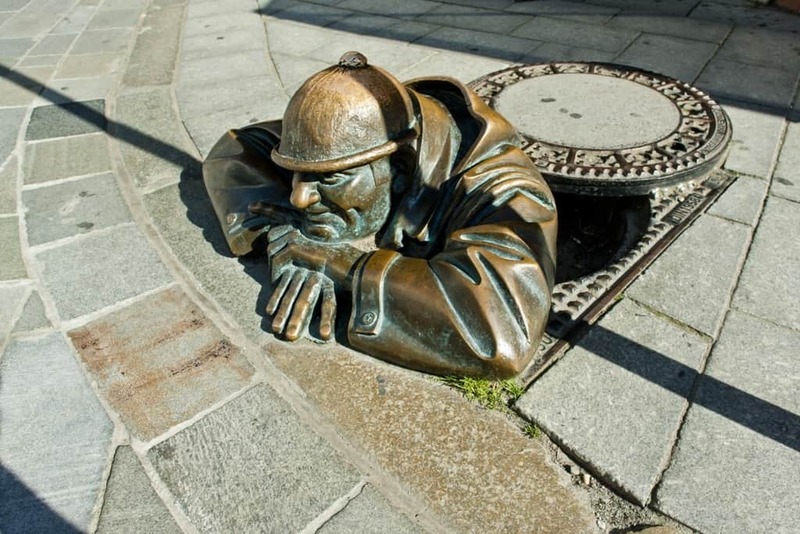 One of the most popular statues gracing the town is Cumil, which translates to “The Watcher.” This statue is of a man peeking up through a manhole in the sidewalk and watching people. Another popular statue to check out is one of a paparazzi man. The man is dressed as a photographer and is caught in mid-motion trying to take a photo. You’ll also find a statue of a Napoleon soldier which shows a man leaning against a bench because he has fallen in love with a local girl during his time in the army. 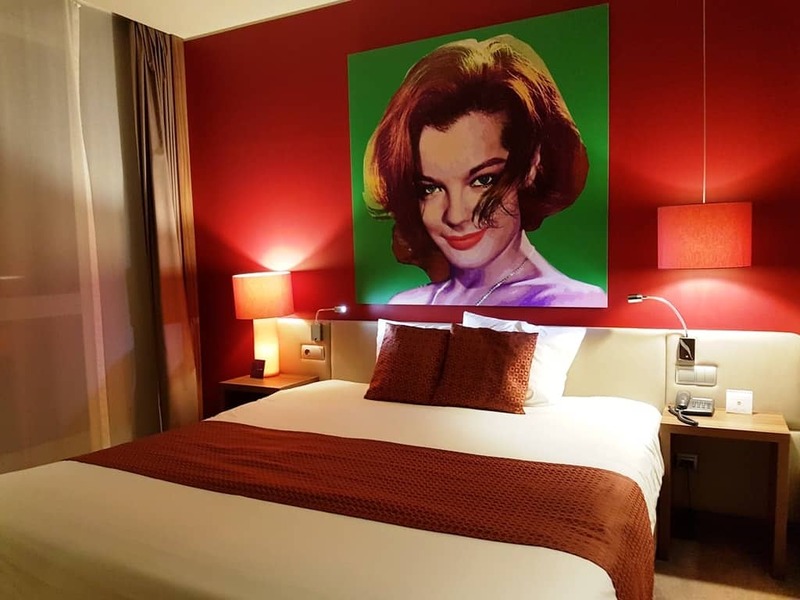 I stayed at the Mercure Bratislava Centrum Hotel an exquisite building located near many of the town’s main attractions, next to Bratislava’s train station. 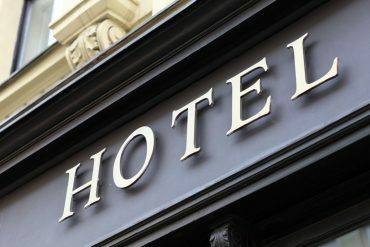 The hotel is designed with a contemporary flair which adds a unique contrast to the historic city it’s situated it. This luxurious hotel offers many helpful amenities like a restaurant that serves traditional Slovakian food. 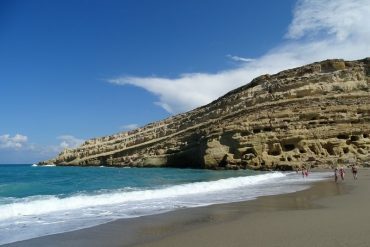 It also has a bar which serves a variety of interesting cocktails as well as an extensive wine list. Besides this, you’ll also find a library inside as well as free Wi-Fi access. Click here for more information and to check the latest prices. 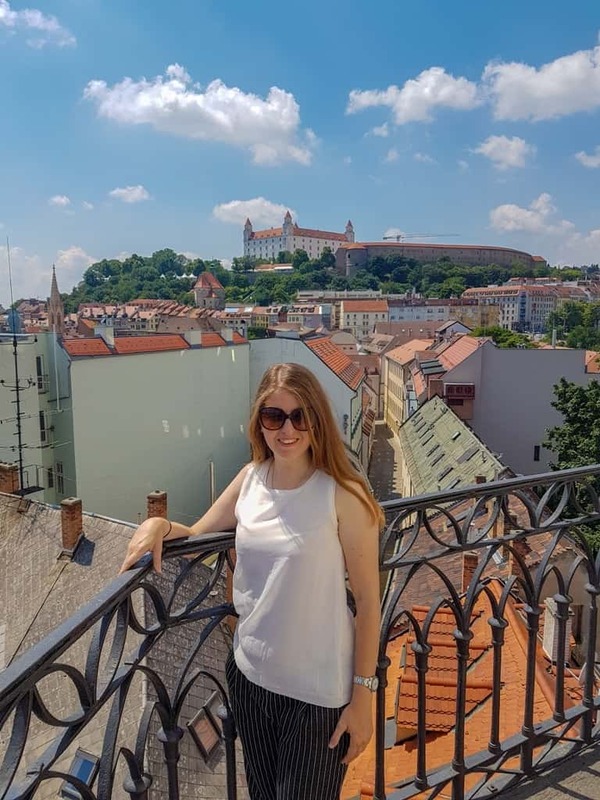 One day in Bratislava is certainly not enough to experience everything it has to offer, but you’ll still be able to explore and learn more about this incredible city quite a bit even with the short amount of time you have. It’s historic and filled with beautiful architecture which means it should be on anyone’s list to visit. 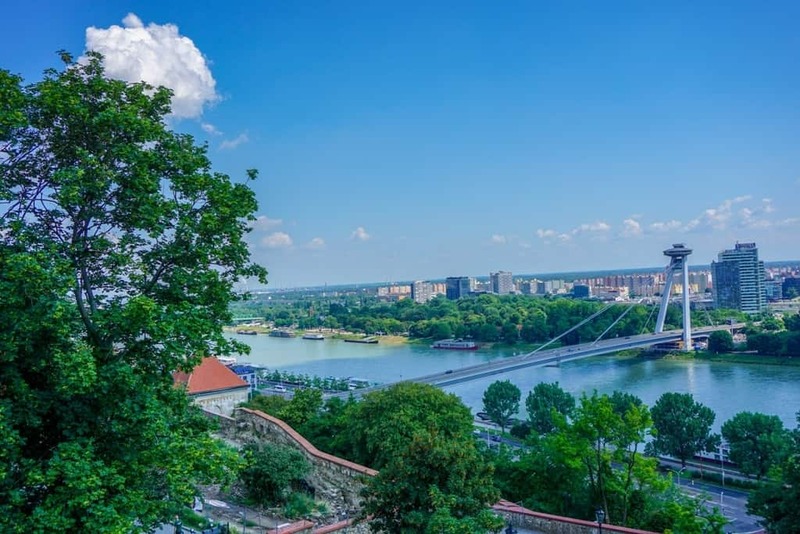 If you’d like to experience Bratislava in a day, definitely consider the spots mentioned above which will allow you to see as much as this city as possible during your visit.